With as much time as we Americans spend behind the wheel, it’s no wonder that people get a little testy every now and then. However, annoyance can quickly escalate into anger, i.e. road rage. Road rage is defined as aggressive or violent behavior stemming from a driver’s uncontrolled anger at the actions of another motorist. 1. Take the high road. 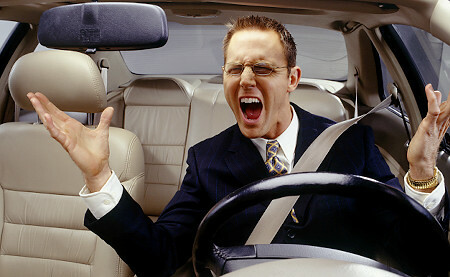 If a driver yells or makes an obscene gesture, don’t engage. It’s best not to make eye contact at all, in fact. 2. Give them space. Physical space can protect you in case the driver acts erratically. 3. Disengage. If you’e on the highway, you might consider pulling off and taking an alternate route. 4. Recenter. Put on some calming music and try to think about other things than the rude driver. You don’t have to let them ruin your day! 5. Report it. Things can get ugly really fast. If you feel personally threatened or feel like the other person is a hazard on the road, don’t hesitate to call the authorities. Remember, one of the most dangerous places to be is behind the wheel. Don’t compromise your safety or others’ by reacting.